One would think, that the topic nearest and dearest to my heart, would have been the easiest one to write! I think the answer is in the title with – “And Everything”. To me, Art is Everything. Art brings joy. Wandering artists’ galleries, craft fairs, County and State craft fairs, etc. In the giving and receiving of art – in the instruction and training of observation that leads to better rendering with the pen, pencil, chalk stick or paintbrush. I may have gotten it from my grandmother. Few and far between would one find a scrap of her notes with out her chicken scratch on it. No, I literally mean pencil Scratches of Chickens eating Corn, picking at flowers, tossing a pebble, almost always with a little scripture verse notated. Even on a grocery list. Funny – wouldn’t ya know that my passions – have been passed down to the boys? They are quick to grab a camera or a pencil to capture a moment. Free flowing with words of poetry. Enjoyers of great music. Listeners of descriptive tales taking us to far away lands. Where does one start with the “And Everything”? 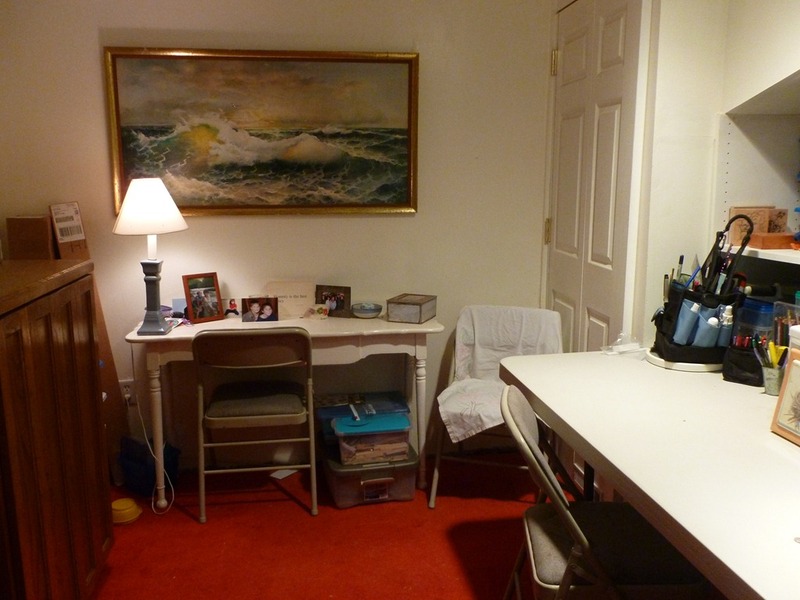 I was reading Harmony Art Mom’s post yesterday about Acrylics and her high school son, and saw that her table was turned sideways to the wall. I have often smiled her personal art table at her window. 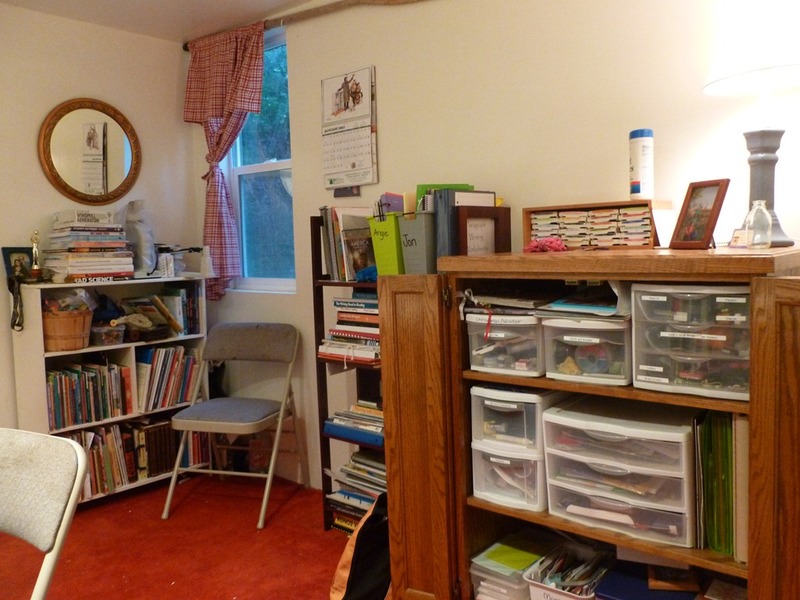 At our home, we have an extra room, created from our garage space, that keeps all of our learning tools. 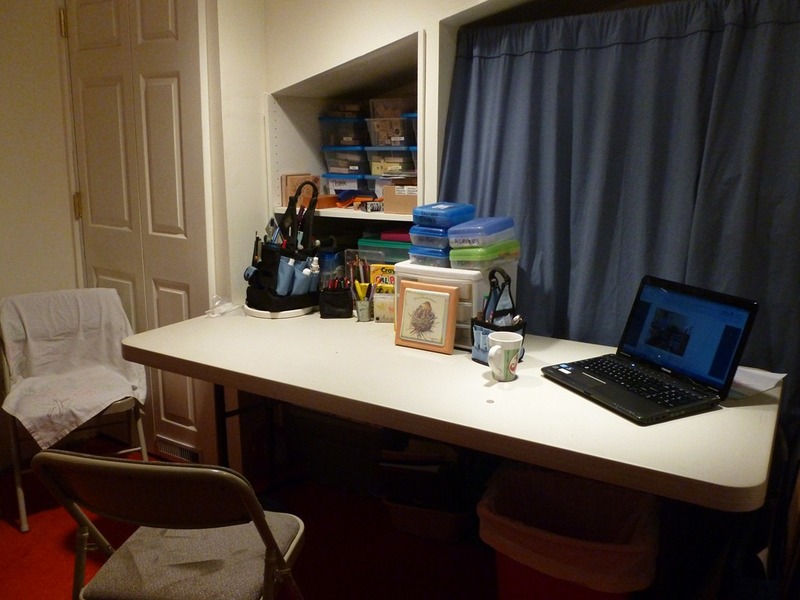 I have a shelf for Science and Math, a small shelf for items we are currently using, and my Craft Center (entertainment center on rollers found at a garage sale for $25.00). This opens up to hold all some of my scrapbooking /lapbook/art supplies. I allow the boys free access to this cupboard, as long as items go back to their happy little labeled spots. The boxes under the small table, are Jon’s. 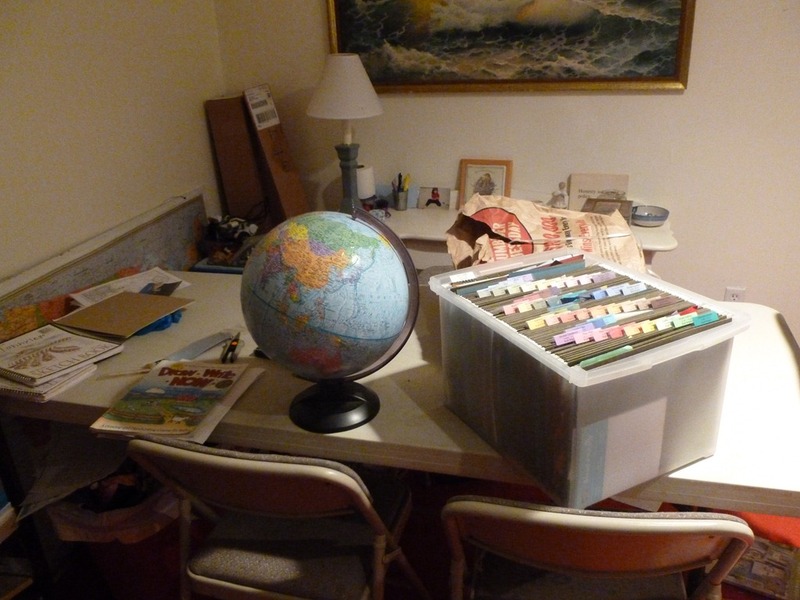 Construction paper, popscicle sticks, glue guns, wood burners, pipe cleaners, glue, paint, beady eyes, etc. Everything is separated into gallon ziplock baggies, easy to take out and put back. I really never know what condition the large table will be in when I open this door – he’s usually in the middle of some project. And here is the new 2 seater craft area. We could pull it out if we wanted more, but really, with more, the kitchen table that seats 8-10 is a much better option! 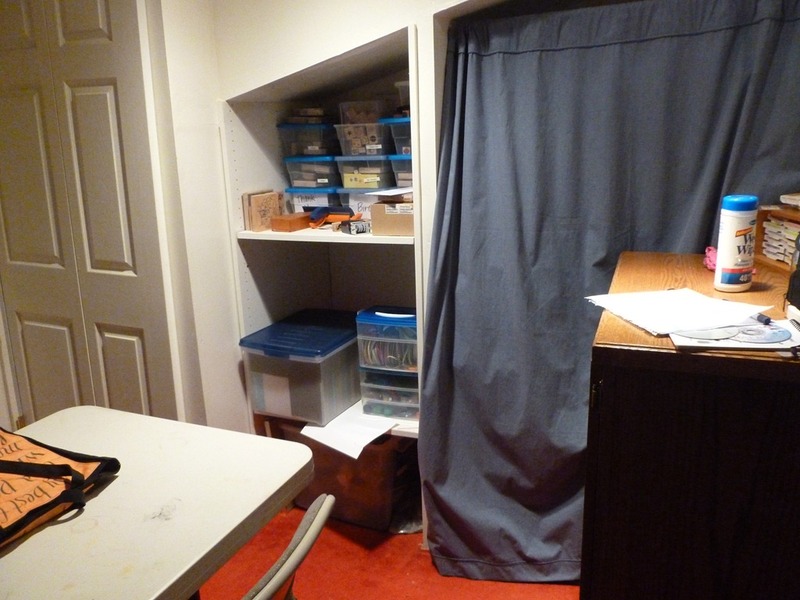 The closet doors is our forced air gas heater unit, and the curtain has tupperwares of scrapbooks, curriculum I should sell, filed papers, etc. Even two large totes of rocks. So it is perfect for the table to be moved. 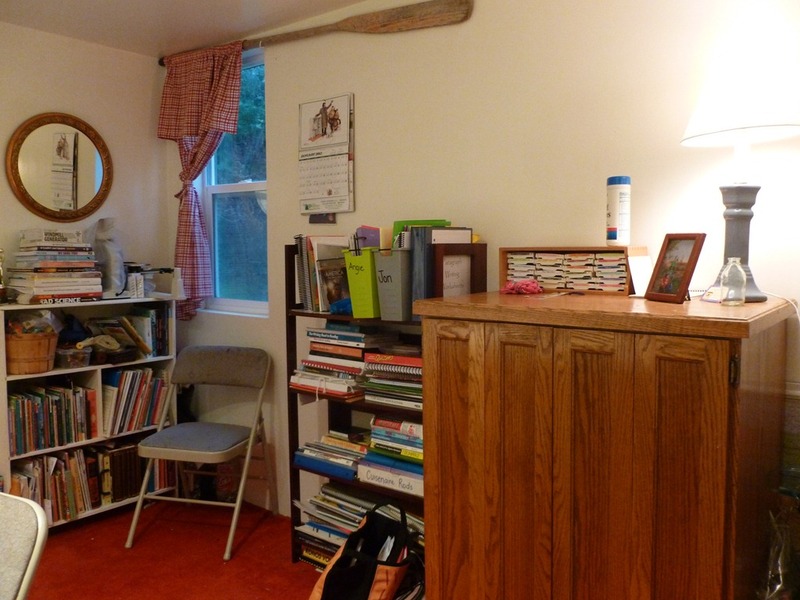 I moved the shelves to bring up the shelf flush with the table. Perfect! Jon looked last evening with excitement and asked if we could “do school” out here today! You’ve seen the tools we have – I count them as important as any book to help you learn about art. I can’t stress enough the importance of training your young children to enjoy container storage. Find a system that works for you, make sure part of your learning time is the clean up time as often as possible! Taking care of the craft supplies should be an important part of training! 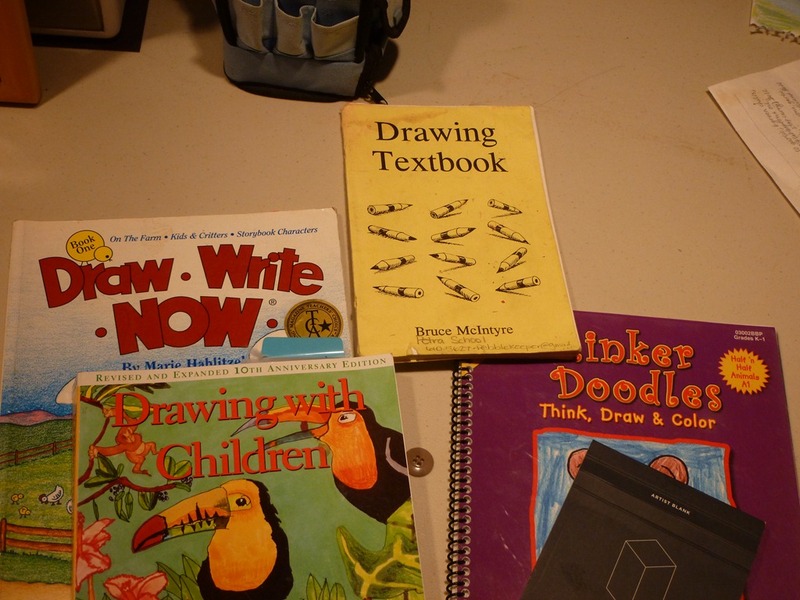 The longest standing book we have used is the Drawing Textbook by Bruce McIntyre. Simple drawings – 15 minutes a day – to help train your fingers to draw what your eye is looking at. Mostly lines, ovals and shading. No directions to draw bears or elephants. Our early favorite was Draw Write Now. I’d have the whole series, but our libraries have carried them. Have a reluctant writer? Maybe their hand strength needs built up. Fun simple drawings that use the curves that are needed for letters, short instruction parts that require minimal observation, and then a few short sentences if they would like to narrate their drawing. Drawing with Children – I’ve had this book a couple of times, and recently picked it up to help with our Harmony Fine Arts Grade 4. We switched to Artistic Pursuits Jr High Book 2 for the Harmony Fine Arts Grade 8 recently. Our nature sketching has probably done the most to incorporate these skills into our lives almost on a daily basis. Using the Handbook of Nature Study’s description of Sketching – Observation – learning to SEE what you are drawing. Training the boys to draw what is in their eye – direct vision – rather than a symbol of what they think I, the Teacher, wants. For example, have a child draw a tree, or a house, or a flower – they probably will draw a symbol type drawing – rather than what they see. Well – the coffee is getting cold, it’s time for our morning Daddy Hour, and any of my regular readers will know that my largest desire in life is for Phyllis, Tricia, Barb and my Almost Unschooling Mom friend to convince their hubbies to buy a time share on the West Coast and play with me so we can adventure, craft, create, and enjoy every day of the winter! Until that happens – I encourage you to get together with them as I do – through my Google Reader – we share every day how we bring Art into Everything! 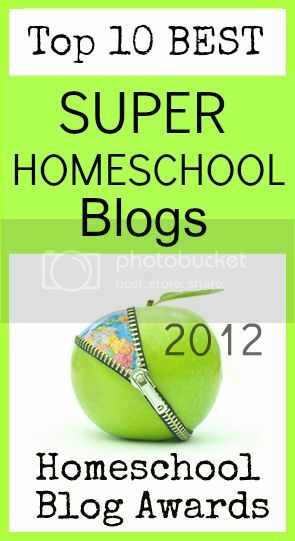 This entry was posted in Some Schooling and tagged Art, curriculum fair, HomeSchool, Middle School. Bookmark the permalink. We have all the same books as you! Funny how I didn’t think to mention them in my post. Laziness, probably. I love your cabinet in the school room. 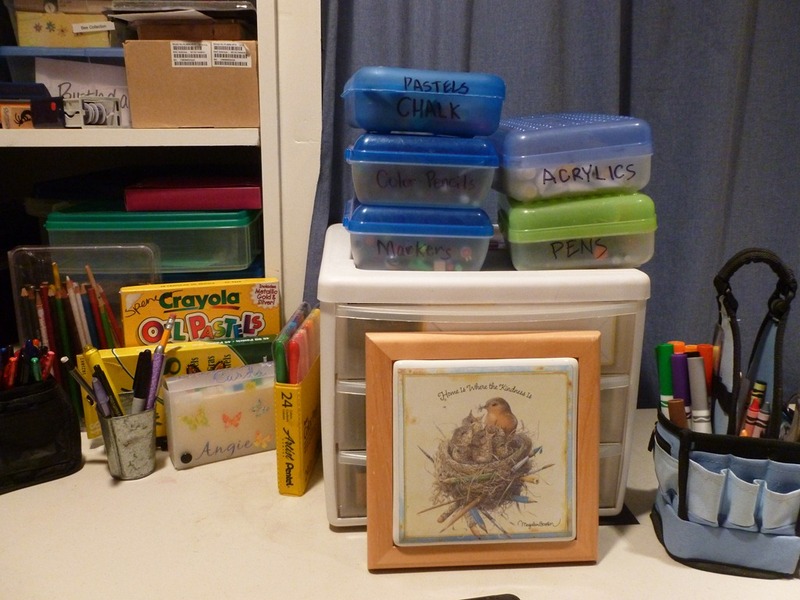 I adore cabinet that hide the chaos, I mean the supplies. Well now, you fooled me. I thought it WAS a better homes and gardens tour! I love your ‘re-do’! I’m with Jon – it is so inviting I’d love to do school there too. You have done a fabulous job. 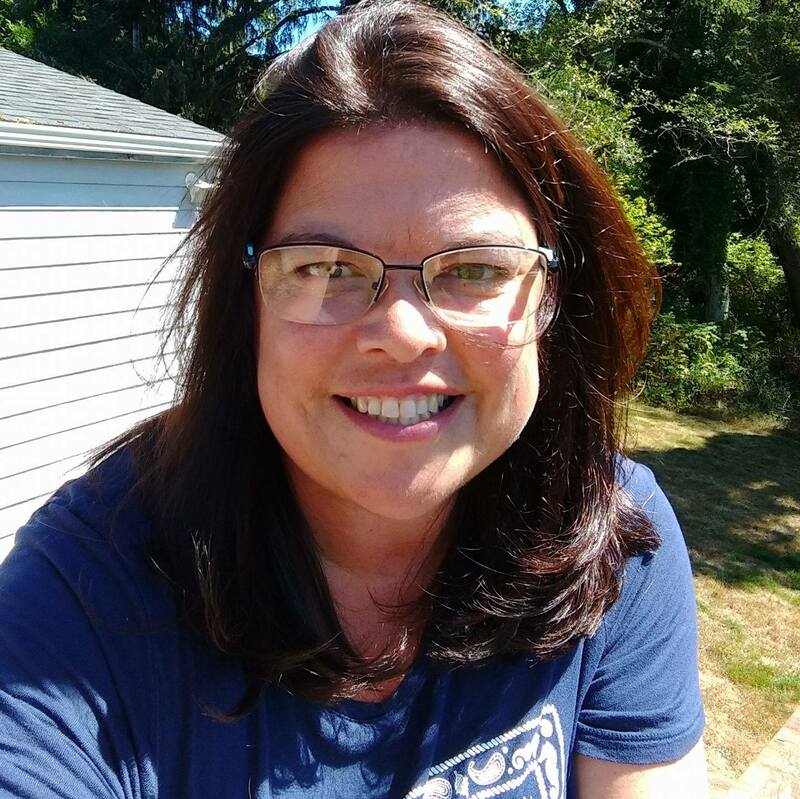 Great post, thank you for sharing with the Virtual Curriculum Fair. I love Bruce McIntyre’s little book. And keeping supplies readily available is definitely a good thing (but, sadly, I can’t keep the 2-year-old out of them when I do that and she’s a whirlwind). 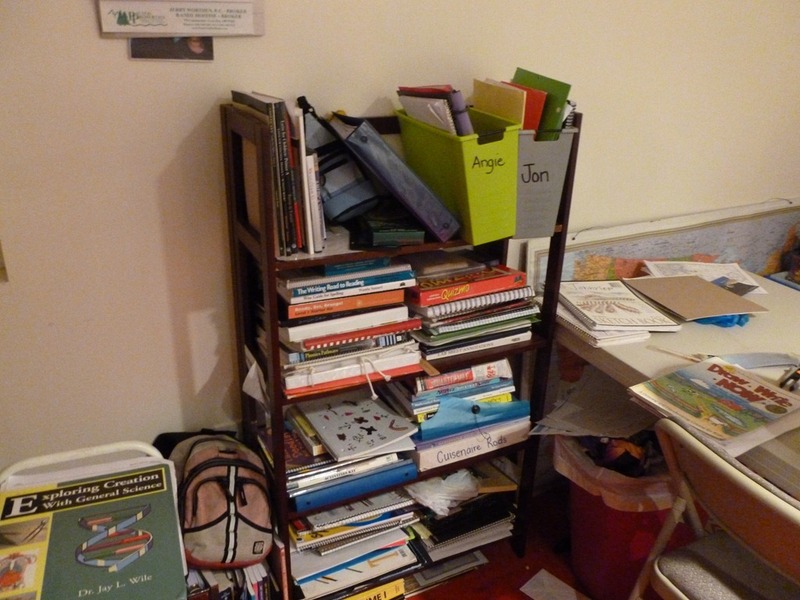 We are working on setting up an “art center” with high-wall-mounted shelves to try and solve that.